The Circassians and the Olympics: Did the age of genocide begin in Sochi? Did the Age of Genocide Begin in Sochi? “The Mountaineers Leave the Aul,” by P.N. Gruzinsky, 1872. Of the myriad controversies surrounding the upcoming Olympics, one that’s gotten relatively little attention—at least outside Russia—is the ongoing campaign against the games by the global Circassian community. The choice of Sochi as a venue has highlighted a tragic but largely forgotten chapter in the region’s history. The Circassian Genocide, book published last year by Occidental College historian Walter Richmond, makes a compelling case that Sochi was the site of modern Europe’s first genocide, a crime against humanity that presaged many of the worst atrocities of the 20th century. The Circassians, who also self-identify as the Adyghe, were once one of the predominant ethnic groups of the North Caucasus, predominantly Sunni Muslim and speaking a distinctive group of languages. They also had the unfortunate historical luck to have lived between two expansionist empires—Czarist Russia and Ottoman Turkey—at the worst possible time. Russia had gradually pushed southward into the Caucasus from the 16th through the 19th centuries, making efforts to “pacify” the local inhabitants, forcing them out of their traditional homes in the mountains to more accessible and controllable areas along the coast. This often involved giving Cossack groups the right to settle in the region. Neither empire had much infrastructure in the region, but in 1829, Russia and Turkey—after a two-year war—signed the Treaty of Adrianople, which formally recognized the czar as the ruler of Circassian territory along the Black Sea, which accelerated Russia’s efforts to consolidate its control over the areas. As one Russian general put it at the time, Alexander II thought that the Circassians “were nothing more than rebellious Russian subjects, ceded to Russia by their legal sovereign 50 the Sultan,” when in fact they were “dealing with one and a half million valiant, militaristic mountain dwellers who had never recognized any authority over them.” Clashes between Circassians and Cossacks were frequent, and often resulted in punitive raids by Russian forces. St. Petersburg also began a policy of strongly encouraging the Circassians to move to Turkey. The plight of the Circassians became a cause célèbre in Britain during the era of the “Great Game,” often accompanied with exotified portrayals of their traditional life. (The beautiful Circassian woman was a popular trope used in European advertising and pop culture in the 19th century.) During the 1853–1856 Crimean War, British agents encouraged the Circassians to rebel, and the locals anticipated a military intervention in the Caucasus that never arrived (a fate that would repeat itself for other victims of mass atrocities in the decades to follow). As Richmond writes, the Treaty of Paris, which ended the war, had “declared Circassia a part of Russia but did not accord the Circassians the same rights as Russian Subjects. The Russians could deal with them as they wished, and St. Peterburg chose to treat them as an enemy population occupying Russian land.” The Circassians were, in effect, stateless people. After the war ended, Alexander decided that rather than attempting to pacify the Circassians, they should be forcibly relocated to Turkey. And in 1859 the military began a campaign of destroying Circassian villages and massacring their inhabitants to drive them to the coast. With the fairly cynical encouragement of the Ottomans, many Circassians resisted, but the “Caucasus War” was a one-sided affair and Russia declared victory after a last stand by the Circassians at Sochi in 1864, after which the formal evacuation of the group by ship from the Black Sea coast to Turkey began. 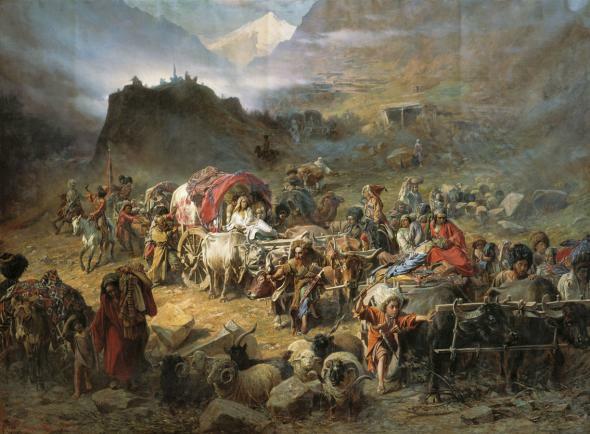 Despite a horrific humanitarian catastrophe taking place along the coast, with those waiting for boats to take them away dying in massive numbers from typhus and smallpox amid a brutal winter, Russian troops continued their campaign of destroying Circassian villages in the mountains, creating thousands more refugees. Turkish ship owners did not help the situation by overcrowding their boats and charging exorbinant fees to the refugees. According to Richmond’s estimates, about 625,000 Circassians died during the operation. And somewhere between 600,000 and 800,000 people were deported. Did the deportation of the Circassians constitute a genocide? Richmond argues that under the modern international legal definition, which refers to acts “committed with intent to destroy, in whole or in part, a national, ethnical, racial or religious group,” it does. The fortunes of the Circassians were not improved much in the subsequent years. The language and religion of the few who managed to remain in the Caucasus were suppressed by the Soviets, though they were spared the fate of the Chechens, who were deported en masse under Stalin. Most were dispersed across the Ottoman Empire and the Middle East, and in a cruel twist of fate, some were once again the victims of an ethnic cleansing campaign in the Balkans during the Russo-Turkish War of 1877. About 1,500 Circassians returned to the Caucasus after the collapse of the Soviet Union, including 200 repatriated after they were attacked by ethnic Albanians during the Kosovo war. More recently the Circassians have been in the news when hundreds of them fled their longtime homes in Syria back to Russia to escape the civil war. A number of them are currently applying for permanent residence in their ancestral homeland. Israeli Circassians have also held protests over what they believe is discriminatory treatment in recent years. Today there are about 3 million to 5 million Circassians living abroad and about 700,000 in the Caucasus. The post-Soviet Russian government has been slow to recognize the extent of what happened to the group and has strongly resisted attempts to label it as genocide—the anti-Russian government of nearby Georgia did so in 2011— portraying Circassian nationalism as merely an outgrowth of the region’s Islamic radicalism. The global community commemorates Circassian Genocide Memorial Day every May 21. However, the decision to hold the games in the symbolically important city of Sochi has focused new attention on the issue, with Circassian activists in New Jersey launching an international campaign against the “genocide Olympics.” The group has been protesting since Vancouver, and one of its pamphlets informs athletes that they’ll be “skiing on mass graves.” It’s possible that local activists may attempt to stage some sort of opposition at the games themselves, though the authorities have been coming down hard on protests of all kinds. Given the painful memories associated with Sochi, it’s understandable that Circassians have reacted with outrage to the choice of venue. But it also may be the only thing that could have reminded the world of a largely forgotten tragedy.